Common Palm Civet at JNU! For all the Delhiites who havn’t really seen any real ‘wildlife’ in the city, you’ve got to check this out. Dr. Surya Prakash of JNU spotted a COMMON PALM CIVET (Paradoxurus hermaphroditus Schreber 1778 ) near JNU’s SBI ATM! The Common Palm Civet is a rare animal which is listed in Schedule II part II of the Indian Wildlife (Protection) Act, 1972. It is a nocturnal and omnivorous animal that prefers to feed on fruits. NextWork on biodiversity park in the ridge stayed! I have taken around 50- 60 photos of this Wild Animal . Also when some one killed this animal in night by a car in Campus itself. Pleas be careful for animals also while driving. Very good and exciting sighting. This shows, so much we are yet to know what animals are living along with us in Delhi. This is mainly thanks to so much of open spaces with vegitation in and around Delhi. I have sighted even Mongoose in Malaviya Nagar. They make a living in the parks. Isn’t that interesting. Congratulations to Surya Prakash, who has been reminding us of wild life around JNU’s 1000 acres green campus. Dr. Prakash amply defies the myth sometime propogated that JNu campus in losing its grip over wild life. I remember he has captured even rare birds breeding and so on. Good work and we want to communicate that we do care. Does the Common Palm Civet, have a long and furry tail? Unfortunately, we’re unable to see the tail. Several years back, I had photographed a very similar looking dead animal on the Aruna Asaf Ali Marg. I showed it to some people at WWF and they told me it could be a Civet. Thanks for nearly confirming, that this was the same animal. 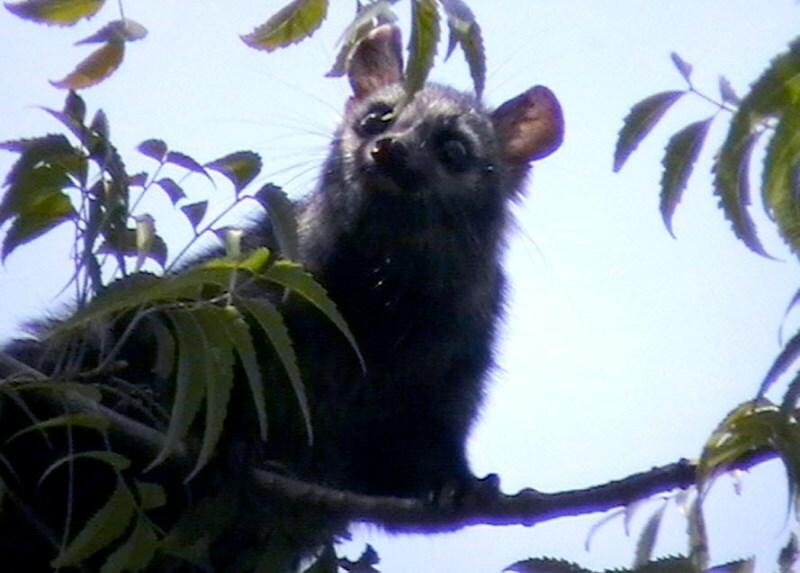 The most recent sighting I had of the Common Palm Civet was in Vasant Kunj, about 4 years back, when it was climbing some first floor resident’s canopy above the window at night. It ‘s really a very good and wonderul picture of the rare animal. We are in a way yet to know about many new and unknown things. You are really an inspiring and ambitious to anyone around you. JNU campus with its wide range of flora and fauna has one more add in it. Congratulations to Surya sir……….finally you achieved your goal….that was the ultimate goal of your life…………..my god wishes to you. JNU is a place where we can see beauty, varieties, culture, and customs. Really good piece work and efforts, whole JNU family should come forward to protect and conserve the wild life…I feel proud that I am also a part of JNU. Nice photograph. It is good to know that you are going back to the topic of your own interest which fascinated you about 25 years back! I wish you all the best for your future endeavours …..
Great! Thanks! I noticed the same animal once a few years back around the midnight on the east side road towards VC’s lodge. Looks like you are becoming a wild life scientist. Hope everything is fine with you and your family. Here we are all fine. Good job and thanks for sharing it with me. Keep it up. Good to see your work getting recognition. Congratulations again. The sighting of Palm Civet in JNU campus by Surya Prakash is just one of his recent accomplishments. An ardent Nature lover, he has recorded excellent pictures of wildlife in JNU campus. Because the wild life animals and birds can not be easily sighted during the day, this is also testimony to how effectively and productively one can use the early mornings and evenings, without disruption of work! Congratulations! Keep up the good work. Congratulations, excellent job. Also spotted by me in one of the warden’s house, Periyar hostel. It’s heartening to see your work getting recognition. All the pain taken over the years finally gaining you your due. Wish you all the best in all your future endeavours. Excellent find!! i have never seen such a thing in Delhi…never on a tree top anywhere. Seeing these rare animals is very interesting. Its a message to everybody to preserve the nature. Reporting another sighting: I got back home past midnight yesterday and was greeted by a ‘wild cat’ sitting on the steps leading to my house. It stayed for a bit and then ran away. I could not take any pictures. A Google search to identify what I thought was a ‘cat’ led me to this site and I realized it was a Civet. I live in Green Park adjoining Deer Park. ..thanks for sharing this information..
May I simply say what a relief to discover somebody that genuinely understands what they’re discussing on the web. You certainly realize how to bring an issue to light and make it important. A lot more people must look at this and understand this side of the story. I can’t believe you aren’t more popular given that you most certainly have the gift. adding this RSS to my e-mail and can look out for much more of your respective interesting content. Nice Site, Keep up the beneficial work. thnx.